Celebrated American yacht designer Bill Langan – who designed the ”Spirit of Bermuda” sail training vessel and competed in 20 consecutive Newport-Bermuda races before going on to become the event’s technical director — died in Boston on December 31. He was 55 and had been battling leukemia. The marine architect — who lived and worked in Jamestown, Virginia – designed the 112-foot schooner “Spirit of Bermuda” for the Bermuda Slooop Foundation and took particular pride in his work on that project. “The design was based on an 1831 painting, by artist John Lynn, of an early to mid-19th century Bermudian vessel called a ballyhoo schooner,” Mr. Langan told a Virginia newspaper shortly after the ship was launched in 2006. The vessel was built to educate young Bermudians about life at sea and their maritime history. From original concept to the “Spirit of Bermuda’s” launch, the Bermuda Sloop Foundation project occupied Mr. Langan for a number of years. “I was involved in the process for about seven years,” he said. “The Foundation had to get sponsors, and make many decisions about the requirements for the boat. From drawing the plans to launch spanned approximately three years. I was honored to be involved with such a worthwhile project, and I’m happy to see that everyone is satisfied with the results. In 2000 Mr. Langan’s design “Sagamore” took line honours in the Newport Bermuda Race he was so long involved with either as a competitor or an official. Mr. Langan grew up in Connecticut, and earned his bachelor’s degree in Naval Architecture & Marine Engineering, going on to join the design firm of Sparkman and Stephens in New York in 1978. During 20 years with the company, he designed more than 300 yachts, including the 12 metre sailboat that won the America’s Cup in 1980. In 1998, he founded his own firm, Langan Design Associates in Rhode Island, and the company has since completed more than 40 designs. 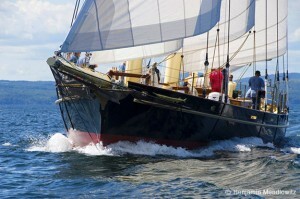 His first design, the 130-foot ketch Victoria of Strathearn, won design awards from both ShowBoats International and the ISS. Later designs include Eos, a 305-foot 3-masted schooner, one of the largest private sailing yachts in the world to date. Ms Langan is survived by his wife of 30 years Candace, their two children Tom and Annie, his parents Dr. Michael Langan and Kathleen Langan, as well as numerous other family and friends. A memorial service will be held on Saturday, January 8 at 2 pm at St. Matthew’s Episcopal Church in Jamestown. Bill Langan was more than the designer of the Spirit of Bermuda, he was a friend and supporter of the organization. He once said that she would be the fastest tall ship on the water when she was completed and the Spirit has proved him right. He was an excellent sailor and a great person. He will be sadly missed by his friends at the Bermuda Sloop Foundation and the many local members of the Cruising Club of America of which he was a valued member.